On September 30, Prime Minister Jun'ichiro Koizumi carried out the first reshuffle of his cabinet since the launch of his administration in April 2001. Six of the 17 ministers (excluding the prime minister) in the previous cabinet left their posts. State Minister in Charge of Economic and Fiscal Policy Heizo Takenaka has assumed a dual role, also taking responsibility for the stability of Japan's financial system as State Minister in Charge of Financial Services. Minister for Foreign Affairs Yoriko Kawaguchi, Minister of Finance Masajuro Shiokawa, and Minister of Economy, Trade, and Industry Takeo Hiranuma retain their posts. At a press conference following the launch of his new cabinet, the prime minister explained that he had carried out the reshuffle "in order to advance and accelerate structural reform even more firmly." Setting out the major objectives of his administration, Koizumi expressed his determination to conclude the disposal of nonperforming loans in fiscal 2004 (April 2004 to March 2005), to ensure peace and stability by emphasizing international cooperation, and to push ahead with reform of the public sector. He said: "In order to convince people and markets at home and abroad that the government and the Bank of Japan are together making full-fledged efforts to dispose of nonperforming loans, I think it is easier to understand if one minister takes charge both of economic and fiscal policy and of financial services." The new entrants to the cabinet are Minister of Agriculture, Forestry, and Fisheries Tadamori Oshima; Minister of the Environment Shun'ichi Suzuki; Chairman of the National Public Safety Commission Sadakazu Tanigaki; State Minister in Charge of Defense Shigeru Ishiba; State Minister in Charge of Okinawa and Northern Territories Affairs and Science and Technology Policy Hiroyuki Hosoda; and State Minister in Charge of Disaster Management and Special Zones for Structural Reform Yoshitada Konoike. Ten-term member of the House of Representatives; Minister of Health and Welfare; Minister of Posts and Telecommunications; Chairman, Committee on Finance, the House of Representatives. Three-term member of the House of Councillors; Parliamentary Vice Minister of Finance; Chairman, LDP Diet Affairs Committee in the House of Councillors. Two-term member of the House of Representatives and three-term member of the House of Councillors; Minister of Education; Chief Cabinet Secretary (Minister of State); Director-General of the Environment Agency (Minister of State). Former bureaucrat, Ministry of International Trade and Industry; Minister of the Environment; Managing Director, Suntory Ltd.
Eleven-term member of the House of Representatives; Minister of Home Affairs; Chief Cabinet Secretary (Minister of State); Minister of Education; Minister of Transport. President, Independent Administrative Institution National Museum of Art; Ambassador Extraordinary and Plenipotentiary, Embassy of Japan in Turkey; Commissioner, Agency for Cultural Affairs. 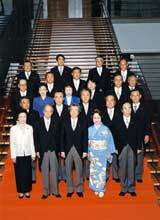 Eight-term member of the House of Representatives; Minister of Labor; Vice Representative, New Komeito. Six-term member of the House of Representatives; Chairman, LDP Diet Affairs Committee; Minister of Education and Director General, Science and Technology Agency (Minister of State); Director General, Environment Agency (Minister of State). Seven-term member of the House of Representatives; Chairman, Standing Committee on Rules and Administration, HR; Minister of Transport. Five-term member of the House of Councillors; Director-General of the National Land Agency (Minister of State) and Minister of Construction; Chair of the Standing Committee on Education, Culture, and Science; Parliamentary Vice-Minister for Science and Technology. Four-term member of the House of Representatives; LDP Deputy Secretary-General; Parliamentary Vice-Minister of Health and Welfare. Four-term member of the House of Representatives; Parliamentary Vice-Minister of Foreign Affairs; Chairman of the Finance Committee, LDP. Seven-term member of the House of Representatives; Chairman, Financial Reconstruction Commission (State Minister); Director-General, Science and Technology Agency (State Minister). Five-term member of the House of Representatives; Senior Vice Minister for Defense; Senior Vice Minister of Agriculture, Forestry and Fisheries. Four-term member of the House of Representatives; Director-General, LDP Election Bureau; Senior Parliamentary Vice-Minister of International Trade and Industry. Professor, Faculty of Policy Management, Keio University; Member, Economic Strategy Council (The Advisory Body of ex-prime minister Obuchi). Four-term member of the House of Representatives; Parliamentary Vice-Minister for Trade and Industry. Two-term member of the House of Representatives and two-term member of the House of Councillors; Chairman, LDP Diet Affairs Committee in the House of Councillors.